Mac OS X is very neat when it comes to uninstalling or removing apps – Simply dragging an app icon to trash bin icon uninstalls the app. However, not all files related to an app are deleted or removed when you uninstall an app. This results in waste of storage space and may reduced speed for your Macbook / iMac mini. In order to avoid these problems, it is recommended to uninstall apps from Mac OS X using app uninstaller or software removers. So here are the Top 3 Best Free Uninstaller apps for Mac OS X to uninstall all type of apps – .dmg, .pkg apps & remove the softwares. 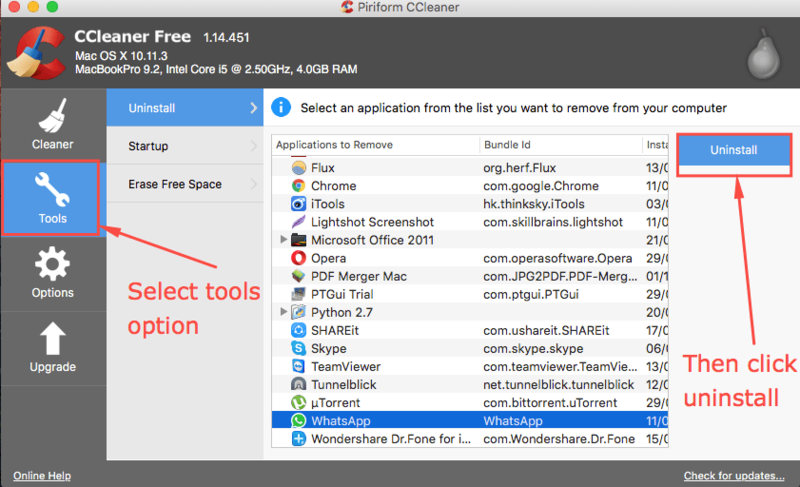 CCleaner by Piriform is a very neat app to free-up storage space on your Mac OS X device by deleting and clearing cache & temp files. Navigate to “Tools” option from left hand menu pane. Here select the name of Application which you want to install from the app list , and then click on the “Uninstall button”. That’s it you’re app will be uninstalled. Click here to Download App (.dmg file) CCleaner Free Version for Mac OS X .
App Cleaner is perhaps the most oldest of mac uninstaller apps and is available for all Mac OS X versions 10.4 & later. It has been tested and found to be working on Mavericks, Snow Leopard, Mountain Lion, El Capitan, as well as Sierra too. To uninstall any app using App Cleaner – simply launch AppCleaner app and then drag & drop the icon of app you want to install into App Cleaner window to Uninstall app!. That’s it! you’re app and all its traces of files will be uninstalled. Click here to Download App Cleaner free for Mac OS X 10.10 & later. Click here to Download App Cleaner free for Mac OS X 10.6 – 10.9. Click here to Download App Cleaner free for Mac OS X 10.4 & 10.5. Instead of classifying as a stand-alone uninstaller , App Trap for Mac can be categorised into a useful uninstaller plugin. App Trap attaches itself into “System Preferences” – > Users – > “Login Items” , and needs to be enabled. When enabled from the settings , the next time you try uninstalling an app from Mac OS X by dragging app into Trash bin. It will ask you to delete additional trace files which are not necessary as shown in the alongside image. Thus, effectively completely uninstalling the App from your Mac OS X device – MacBook Pro/Air / iMac (Mini) etc.